Today is our last day in paradise. 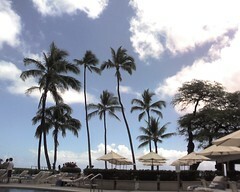 The Halekulani was very gracious and gave us a 3 PM check out time! We were able to go see Pearl Harbor and the USS Arizona Memorial and sit by the pool for a couple hours without having to worry about our luggage. We woke up early this morning (not knowing that we would be able to check out late) and packed. Then, we waited for the V.I.P. shuttle to Pearl Harbor. After dropping some people off at the airport (that was a surprise), we made it to Pearl Harbor. The line for tickets to the Memorial wrapped around a courtyard and was very, very long. But it moved pretty fast. While we waited for our time to go over to the memorial, we walked around the museum and listened to a recording of Ernest Borgnine telling us about the museum and Dec. 7. It's hard not to get teary-eyed listening to the events of the day. The memorial itself was like a graveyard (and it is... literally). It was a very somber place and I was quite dissappointed by the lack of respect shown by some of the other visitors. It was a site to see about an event to remember. After an interesting ride back to the hotel (apparently Cheech is now a shuttle driver, man), we laid out by the pool and took a short walk on the beach. After we get cleaned up and packed, we're going to grab some food and head for the airport.